I’ve been trying to find the right outfit for the Muse Eclectic set since it came out. Something as classic and tasteful as the ads but it just wasn’t happening. Finally, Chai’s new skin The Purple came out and it all came together. The shirt is the Gatsby blouse by Pushbutton Industries. The skirt is the Pencil Skirt in Aubergine from Ingenue. Love this and it comes in a ton of colors cheap. The shoes are from Tesla for a little spice. This one going to be a cute little flirty number but it took a left turn when I got to the skirt so I went with it. The Emily is the top from Pushbutton Industries. And the ring is one of the Catherine Pearl and Diamond Cocktail Rings from Muse. I was thinking about what I was going to wear for New Year’s Eve when I saw the post with this fabulous little cocktail dress by G.L.A.M. It is perfectly accentuated by the Celestine chandelier earrings and TaP’s silver Paillette clutch. I wore this lovely Crystal Frost gown to the Blogger’s Choice Awards. It was a lucky find at Nicky Ree’s when I went to look at the Snow Queen dress. The skirts and sleeves both are layers upon layers of textures on delicate flexi-prims. In the picture I’m wearing Muse’s Celestine Snowflake jewels but they weren’t out then (Bad Caliah! ;->). Still they’re just too perfect for the gown. I’m also wearing Miriel’s awesome Snow Queen Crown. I don’t like white diamonds in rl or sl. They have no color or personality. Why then did I take one look at Muse’s new Celestine series and buy the whole thing? I still have the urge to pet and whisper precious when I look at it. The skin and suit were freebies from Tete a Pied for the opening of their new sim Fleur. The opening party was what they call a “crush” both metaphorically and literally as desperate fashion fans searched for magic tickets. My bag is from Bare Rose Couture. The heavy highlight on top is baked into the texture. 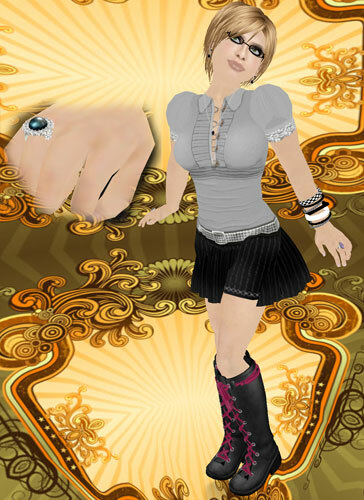 You are currently browsing the Caliah Lyon – Muse category at SL Fashion Notes.